As the sun set over the Los Angeles downtown skyline, it illuminated cotton candy clouds and painted the row buildings in pastels, creating a watercolor world of barred windows and littered gutters. There was a warm stillness to Wall Street; no cars turned down the road and sleepy bodies wandered the sidewalks as the colors faded. We were heading into the heart of Skid Row, the most densely populated area of homeless individuals in Los Angeles. With homelessness on the rise—47,000 in L.A. County, by a recent count—Skid Row has the highest unsheltered population in the United States. It was a heavenly sunset cradled in urban destitution. When we parked our car and opened the door, the smell of human effluence overcame our senses. A lot of people have been asking me what I have been working on this summer, and I’ve struggled a bit explaining. I came to the University of Southern California’s Center for Religion and Civic Culture (CRCC) as a video intern to work on a docu-series for the summer of 2016. The videos are focused on religious innovation and creativity in the greater Los Angeles area. 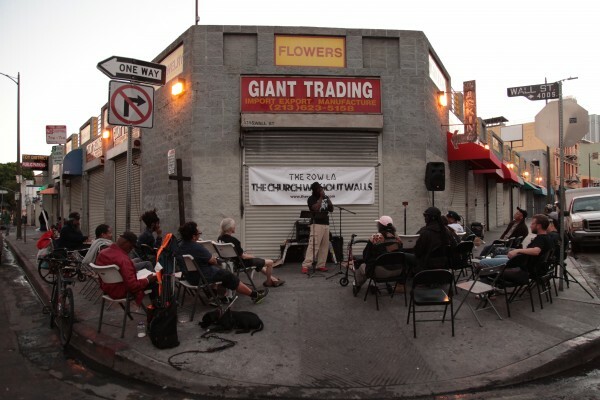 The Skid Row project is a perfect example of the type of creative places CRCC is researching. We went Skid Row late on a Friday night to cover a worship service hosted by The Row Church, a Christian congregation aiming at bringing God and community to the people of Skid Row. The church was founded by Pastor Cue Jn-Marie, a former Virgin Records rapper who left the music industry in 1994 to begin following God. In August 2006, Pastor Cue, as everyone calls him, set forth on building “a church without walls” that would defy the common structure of a house of worship. This place of faith would be located on the corner of Wall and Winston in downtown Los Angeles. Ten years later, Pastor Cue describes The Row Church as a place where the people of Skid Row can come together and find love on the streets. As the sermon began people started to fill in the seats. Some were there to listen to Pastor Cue preach; some were simply looking for comfort on the metal chairs set up for the service. As Pastor Cue’s voice broke the stagnant air and echoed through the intersection, onlookers observed what was going on. Some sat on the ground listening from far away, some played craps in the street, some just passed by, but the energy projected from Pastor Cue seemed to stimulate every person in earshot of the service. There was a sense of liveliness and connection, and as the sun set behind the towers of downtown, Skid Row came alive. Pastor Cue and his church are acting as the spark that ignites the fire of change for those who are struggling to move off of the streets, lighting the way for those to follow. The seats were filled by the time the sun was gone. People stood behind the seats quietly chatting; one woman’s arms spread wide, whispered to herself in tongues. The sermon lasted two and a half hours. As it came to an end, the distant listeners came over to line up for pizza provided by the church following the worship. People mingled, laughed and ate. They embraced each other and praised God under the warm light of the street lamps. It was a community brought together by the thoughtful act of kindness. The Row Church describes itself online as a place where one can find beauty in the midst of chaos and ultimately, a place of refuge and hope. Skid Row is an important community of Los Angeles and is often overlooked because it is considered a problem. What The Row Church did and does every Friday night is invite people in with open arms via a common interest, the desire to belong. It unites a community that often seems unhinged and providing hope for those who have lost hope. A man I met while filming explained to me that he has been coming to The Row Church since it started. He had met a churchgoer during a service who later got him a job on a construction site that allowed him move off of the streets. He told me that he is one of many people who have had this experience. Pastor Cue and his church are acting as the spark that ignites the fire of change for those who are struggling to move off of the streets, lighting the way for those to follow. My fellow video interns and I were there to film the service and capture the event, but I found something more. We were taking part in a significant piece of history. Through the simple acts of kindness brought to Skid Row by The Row Church, the community was being pulled together. They were finding a place of acceptance and ultimately creating lasting positive relationships that would help shape which direction each individual person might go. As the last of the sunlight disseminated into the sky, we remind ourselves that nothing happens overnight. But, the path of progress is being paved by the labor of love.